Speaking ahead of the first of the two Diamond League finals in Zurich, Greg Rutherford had said that despite his major title ‘grand slam’ there remains “a lot of fire” in his belly. “If I can win another Olympic or world title, then I’ll be able to say I’ve had a very successful career,” he explained. But the 28-year-old took another leap forward in his hunt for further career success on Thursday evening as he secured victory in the final round of the men’s long jump competition to wrap up the overall Diamond League title and add that to the full set of major gold medals he completed at the IAAF World Championships in Beijing last week. 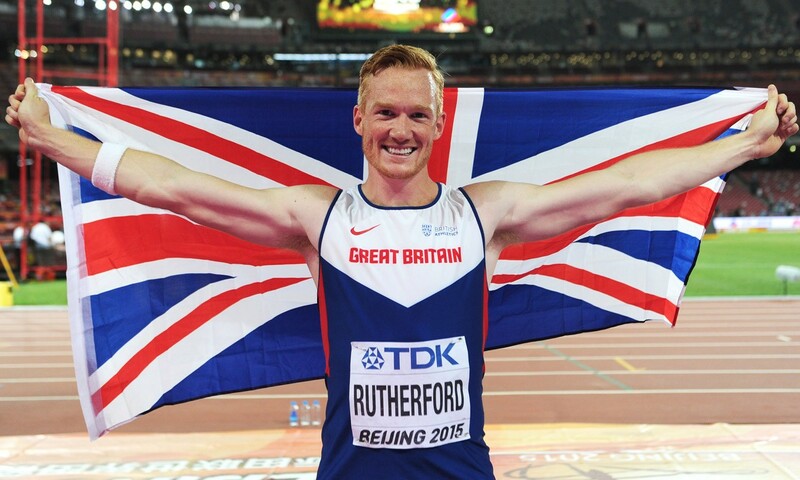 Rutherford had taken an early lead in the competition which he bettered with 8.27m in the second round. USA’s Marquis Dendy, who had failed to make the final for either the long jump or triple jump in Beijing, replaced him at the top with 8.32m in the fourth round but the British record-holder was ready to respond and recorded exactly the same mark in the fifth round to get the win on countback. “I WON THE DIAMOND LEAGUE!” he later tweeted. “Absolutely over the moon. Another world champion victorious in Zurich was Almaz Ayana as she again beat her fellow Ethiopian Genzebe Dibaba but this time over 3000m. The pair had claimed the 5000m and 1500m titles respectively in Beijing, with world 1500m record-holder Dibaba getting bronze over the longer distance, and she again had to watch her compatriot stride away in the closing stages to win in a 8:22.34 meeting record, over four seconds clear. Over in the sprints and Jamaica’s three-time world 100m champion Shelly-Ann Fraser-Pryce again dominated over the distance, clocking 10.93 for victory ahead of a fast-finishing Blessing Okagbare of Nigeria with 10.98. Tori Bowie filled the same spot as in the world final, finishing third in 11.06. Panama’s Alonso Edward, who finished fourth in the 200m in China, clocked 20.03 to beat South Africa’s world bronze medallist Anaso Jobodwana in the Diamond Race, while Britain’s Danny Talbot ran 20.70 in eighth. The medallists in Beijing again filled the top three spots in the men’s 400m but in a different order as USA’s silver medallist Lashawn Merritt ran 44.18 for victory ahead of Granada’s Olympic champion and bronze medallist in Beijing, Kirani James, with 44.28. South Africa’s world champion Wayde van Niekerk was third in 44.35, as Britain’s world sixth-placer Rabah Yousif finished fifth in 45.39. With his win, Merritt wrapped up his third consecutive Diamond Race victory. Kenya’s former world champion and this year’s bronze medallist Eunice Sum and Britain’s Lynsey Sharp finished strongly in the 800m, clocking respective times of 1:59.14 and 1:59.37. Sum’s victory secured her the Diamond Race title, while Sharp’s runner-up spot proved her fine current form after her disappointment of not making the final in Beijing. Marina Arzamasova of Belarus, the winner in Beijing, ran 2:00.69 in fifth, while Sharp’s fellow Briton Shelayna Oskan-Clarke, who enjoyed a big breakthrough in China, ran 2:05.91 in 11th. Not surprisingly, a number of athletes fresh from competing in Beijing had tired performances and one of those was David Rudisha, the world 800m record-holder having added the world title to his Olympic gold in Beijing. The Kenyan clocked 1:45.91 for fourth in a non-Diamond League race won by Poland’s world silver medallist Adam Kszczot in 1:45.55. However, world 1500m champion Asbel Kiprop made victory look easy in Zurich, striding through the field in the closing stages to clock 3:35.79 and also win the Diamond Race. Henrik Ingebrigtsen of Norway had surprised the field with an early surge for glory with just over a lap to go, but in similar style to his victory in China last week the Kenyan came from well behind to time his finish to perfection as Ingebrigtsen faded in the home straight. Britain’s Charlie Grice, who placed ninth in Beijing, finished 10th in 3:39.79. After becoming the first to successfully defend the women’s world 400m hurdles title, Zuzana Hejnova of Czech Republic held off Denmark’s Sara Petersen – 54.47 to 54.57 – to regain the Diamond Race trophy she won in 2013. Last year’s Diamond Race winner, Kaliese Spencer of Jamaica, finished fourth in 55.29 as Britain’s European champion Eilidh Child clocked 56.14 in eighth. The world champion won the men’s event over the barriers too, as Russia’s Sergey Shubenkov clocked 13.14 in the 110m hurdles. USA’s David Oliver took the Diamond Race. Much to the delight of the Zurich crowd, Kariem Hussein of Switzerland won the men’s non-Diamond League 400m hurdles in 49.16, as Britain’s Niall Flannery clocked 51.26 for eighth. There was further success for Swiss athletes in the wheelchair races as Marcel Hug won over 3000m, clocking 6:03.75, and Manuela Schär over 2600m in 6:12.76. Britain’s six-time Paralympic champion David Weir finished fifth after a crash with 300m to go. Paul Koech won the 3000m steeplechase in 8:10.24 as world leader Jairus Birech, who finished fourth in Beijing, finished second in 8:10.24 to retain the Diamond Race title. Four-time world champion Ezekiel Kemboi clocked 8:21.16, one place behind USA’s Evan Jager with 8:18.39. World bronze medallist Robert Urbanek won the discus with 65.78m as world champ Piotr Malachowski threw 65.04m in second to claim the overall title. Christina Schwanitz wrapped up her shot put victory, winning both the competition in Zurich and the Diamond Race with 19.91m. USA’s world champion Tianna Bartoletta was another to also secure the Diamond Race as she finished second with 6.97m behind Ivana Spanovic’s 7.02m Serbian record. After jumping a British record in Beijing, Shara Proctor leapt 6.58m for third, one place ahead of Jazmin Sawyers with 6.55m, as world fifth-placer Lorraine Ugen placed eighth with 6.31m. Czech Republic’s Olympic javelin champion Barbora Spotakova bounced back after her ninth place finish in Beijing, throwing 64.31m to win in Zurich and claim her fourth Diamond League title. Greece’s world bronze medallist Nikoleta Kyriakopoulou switched the places from China, clearing 4.77m to beat Brazil’s silver medallist Fabiana Murer and Cuba’s champion Yarisley Silva, both with 4.72m. British record-holder Holly Bradshaw, in still just her fifth competition this year, cleared 4.47m for eighth. In the men’s high jump, 2.32m was enough for Mutaz Essa Barshim to win and secure the Diamond Race. In the final event of the programme, a Jamaican quartet anchored by Fraser-Pryce clocked 41.60 to break the Diamond League record in the 4x100m.